Lisa Blair sailed in the 2011/2012 Clipper Round the World, then took on the ITL Solo Tasman Challenge from New Zealand to Australia. She placed PHS 13th overall in her first Hobart (2015). 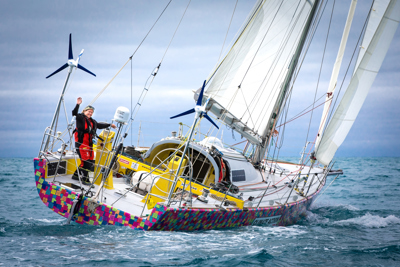 At the time, her next goal was to be the first woman to circumnavigate Antarctica, solo, non-stop and unassisted, but Climate Action’s mast broke in April, forcing her into Cape Town to repair. But she finished the task; first woman to circumnavigate Antarctica solo, crossing the Albany, WA finish at the end of July. She embarked on her epic journey as the recipient of the 2017 Australian Geographic Society Nancy Bird Walton Sponsorship, which supports ground-breaking projects led by women. She will race to Hobart with an all-female crew, including well-regard British meteorologist, Libby Greenhalgh, who navigated SCA in the last edition of the VOR. Blair named her boat Climate Action Now to raise awareness of the environmental climate. It is the former Funnel-Web, originally owned by Ivan MacFadyen and Sibby Ilzhofer who contested the tough 2004 Sydney Hobart with it and finished 48th overall in a race where 59 finished and 57 retired. Blair purchased it in September 2015.